Lucy is an 8 year old Norwich Terrier. She was adopted from a terrier rescue as a Mother's Day gift about 3 years ago. Lucy became a true friend right away. At that time, her new mother was undergoing cancer treatment. Lucy stood right by her side through all the ups and downs. She was a big part of her owner's recovery. Since then she has helped bring strength, love and friendship to her family. Her people decided to bring Lucy to Blue Cross Pet Hospital for a checkup. They took advantage of our Senior Care Package Level 2. This is an extensive work up; it includes the level 1 package plus checks the eyes, heart, lungs and blood pressure. Luckily her test results looked pretty good. Dr. Raymond was able to help treat a few minor issues due to her eye exam and treated her skin allergies. Dr. Raymond also recommended Lucy to have a dental and mass removal procedure. Lucy is a new spring chick nowadays thanks to her people and the caring folks at Blue Cross Pet Hospital. She enjoys her walks and peeking at the neighbor's dog thru the fence. She loves spending her days on the back of the sofa peering out the window. Her family decided a long time ago that keeping Lucy happy and healthy was the best way to share their friendship for many years to come. 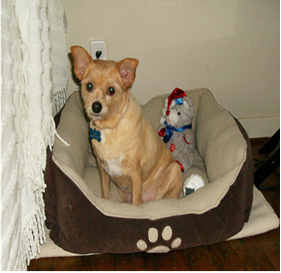 Congrats to Lucy our Summer 2012 Senior Pet.